The Favorite Fib is a Fibonacci-based strategy that takes advantage of momentum. It can be used on various time frames and markets, including forex majors, stock indices, and commodities, providing the trader with endless opportunities. The strategy could be used, for example, after some major economic news — ideally, at the earlier stages of the move following the news. But if the news merely causes a corrective rally or sell-off inside an established trend, then this strategy won’t work as well. It’s best suited for markets that are in a clear strong trend — for example, when the price is making fresh all-time, multiyear, or multi-month highs or lows. The higher the time frame, the more effective the Favorite Fib strategy works. It’s typically used on one- or four-hour time frames, although sometimes it can be applied to the daily time frame, too. The shortest time frame on which you can use this strategy is about 15 minutes. If the trade is based on a higher time frame, it’s a good idea to zoom in to a five-minute chart in order to refine entry. The Favorite Fib strategy is based on some Fibonacci retracement and extension levels: the 38.2 percent and 50 percent retracement levels (the latter is not technically a Fibonacci level), and the 127.2 percent, 161.8 percent, and 261.8 percent Fibonacci extension levels. To understand how the strategy works, let’s say that following a strong upward move (for example, from point A to point B), the market retraces a little (to point C) because of profit taking and/or top picking, before continuing in the original direction (beyond point B). The strategy requires three price swings — the move from point A to point B, from point B to point C (correction), and from point C to point D (extension). The figure shows what a Favorite Fib buy strategy would typically look like. In the Favorite Fib strategy, you’re interested in some part of the CD leg of the move — the bit beyond point B, where entry is based. The profit target would be determined by a Fibonacci extension level of the BC move (more on this later). One condition for this strategy to work well is that you need momentum. By definition, this implies that point C should represent a shallow retracement of AB, and then a continuation in the original direction, beyond point B. So, if price retraces more than 50 percent, or too much time elapses before it breaks point B, then the entry signal would not be valid. In other words, for optimal entry signal, you need a strong move from point A to point B; a relatively quick and shallow retracement of less than 50 percent to point C; and then a continuation toward point D.
When point C is established, all the strategy’s parameters can be determined. The entry would be based on break of point B, and the objective is to ride the move toward point D, which would be a Fibonacci level, determined by the BC swing. For a buy (sell) trade, the entry could be via a buy-stop (sell-stop) order a few pips/points above (below) point B, or it could be via a market/limit buy order after point B is broken. Entry via a stop order ensures the trade would be triggered. However, in the case of a false breakout, it could mean buying (selling) right at the high (low). What’s more, if the market gaps, the entry may not be at the same level as the one the trader had chosen. Entry via a market or limit order allows the trader some time to determine whether the breakout above (below) point B is genuine or false. If price holds above (below) point B for, say, a few minutes, then the trader may want to buy (sell) at the best available price. However, the risk is that the market moves quickly toward the target without a pullback, and the trader misses the opportunity. If the entry is based on a higher time frame — like the four-hour chart — the trader may want to hold fire and zoom into a five- or ten-minute chart and wait until price closes above (below) point B on the lower time frame before buying (selling). One way to estimate which level price would most likely extend to is by looking at the retracement of the AB swing (that is, point C). If the retracement is around 38.2 percent or lower, point D could be at the 161.8 percent or sometimes 261.8 percent extension of BC. However, if price achieves a deeper retracement — say, to the 61.8 percent or 78.6 percent Fibonacci level of AB, then you should expect point D to complete around the 127.2 percent extension of BC. Of course, this would not be a valid Favorite Fib entry, because the retracement is greater than 50 percent. For a buy (sell) trade, the stop loss would be some distance below (above) point B, ideally below (above) a small fractal within the larger swing. 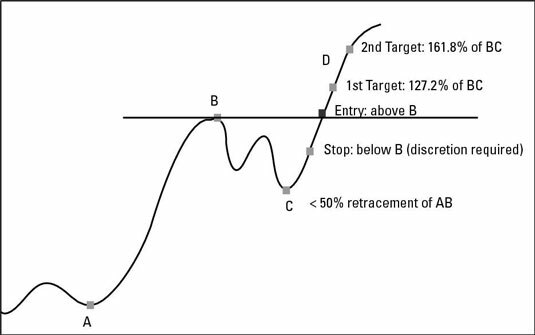 The maximum distance between the stop loss and entry should be less than the distance between entry and the profit target. In other words, the risk-to-reward ratio should be better than 1:1 (ideally, 1:2 or better). For a higher probability trade, the entry should be in the direction of the underlying long- or medium-term trend. The speculator should be aware of other, longer-term, technical levels when trading the Favorite Fib strategy. For example, if the 200-day moving average is at 1.8560 and the target for the long position is at 1.8580, this trade should not have been taken. In this situation, it may be better to take profit at around the 200-day average rather than hope for price to reach the 161.8 percent extension (the original profit target that was based on a smaller time frame). The minute you notice yourself hoping for something to happen is when you know the trade is in trouble — get out as soon as possible. The trader should avoid taking on opposing simultaneous trades in similar markets (for example, going long on DAX and short on FTSE, or long on NZD/USD and short on AUD/USD, and so on). If the trader is feeling bearish about the AUD and at the same time bullish about NZD, she should look for a short trade on the AUD/NZD pair instead. If price breaks point B, triggers the entry order, and then loses momentum prior to reaching the first target (127.2 percent), the trader should close the trade at the best available price (even if it’s worse than the entry price — why wait until being stopped out?). After all, the whole objective of the entry was based on expectation of a generous continuation move, which hasn’t happened. You can’t force the market to give you what you desire. Never blame the market for getting it wrong — it all comes down to your own ability (or lack thereof) to respond to changing dynamics or conditions of the market. 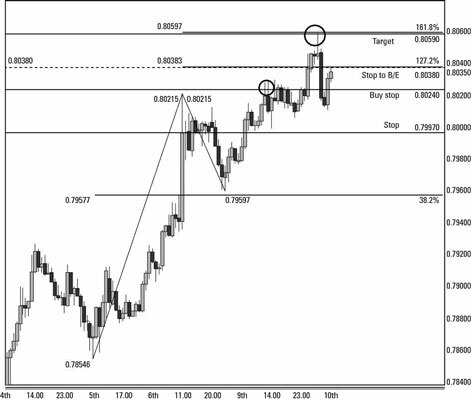 This figure shows you what NZD/USD looks like before it has reached its Favorite Fib target. 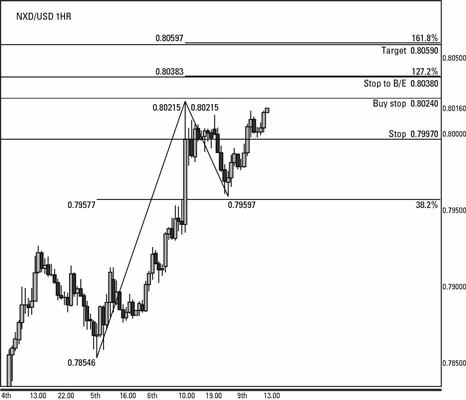 The next figure shows you how NZD/USD managed to reach its target Fibonacci resistance level. 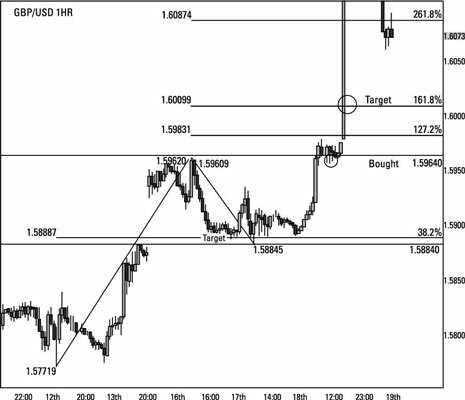 Fibonacci can seem a bit like magic — the support and resistance levels really do work! 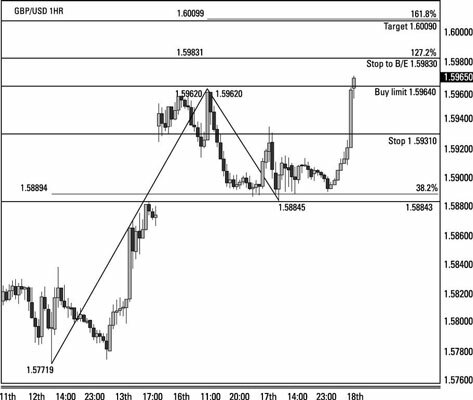 As you can see here, GBP/USD was trading higher ahead of a key economic release. After the economic data release, the pound reached its target. This is another example, of how Fibonacci extensions can work in practice.